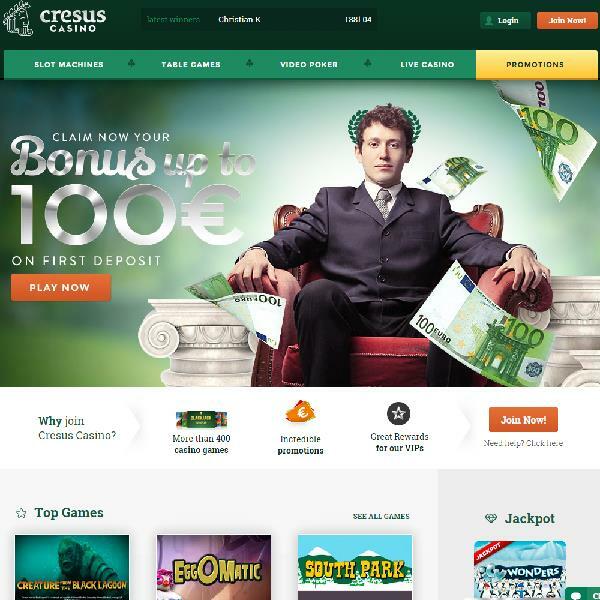 Cresus Casino has just launched and is hoping to attract players with its stylish design, vast selection of games and good value promotions. All members are eligible for a 100% first deposit bonus up to €100 upon joining Cresus Casino. There is also a 50% deposit bonus for referring friends and players that are referred receive a 150% first deposit bonus. The casino also operates a four tier loyalty program; members will become eligible for larger and better value bonuses the more they play at the casino. Cresus Casino’s games are provided by B3W Group, Cryptoligc, iGaming2Go, Leander Games, Net Entertainment and NextGen Gaming. As a result they offer a huge selection of games to suit all tastes. Members can play multiple versions of all the casino standards, such as poker, baccarat, blackjack and roulette and also enjoy a high quality live casino. There are also loads of slots to choose between, such as South Park and Elements, and many titles are linked to sizeable progressive jackpots. The casino is licensed in Curacao and is available in English and French. Players can deposit in US Dollars and Euros via a number of methods such as Skrill, Ukash, ecoPayz, iDEAL and credit and debit card.